Do you ever feel like you have to sacrifice (your self, free time, creativity, passion, love, fulfillment) in order to be successful? Or that you have to sacrifice your success to maintain love? 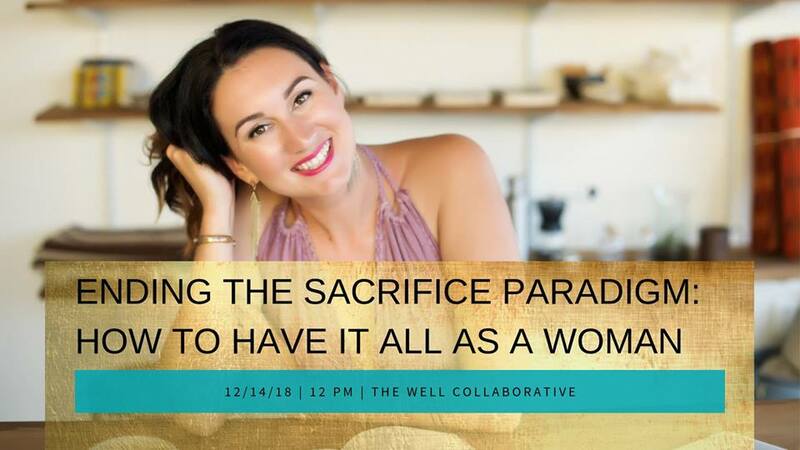 You may be surprised to know that most women are making unnecessary sacrifices everyday because on some level they believe they HAVE to in order to be worthy of ... something. All so you can expand into more financial prosperity, enjoyment & impact in your business and more satisfaction & love in your life. Join Allison Braun, international Business & Life Success Coach and founder of Living Richly Coaching, Masterminds & Retreats + The Business Pleasure Map. Allison has helped thousands and thousands of women from over 11 countries experience more financial prosperity AND life satisfaction while doing the soul & purpose work they are here to do. WHEN: Friday, December 14th at Noon sharp. WHERE: The Well Collaborative just beside and upstairs from Amigos. WHAT TO BRING: A journal & pen if you like to take notes. Water bottle. And, if you're on your lunch break and need a snack feel free to bring one along. Self Care for the Holidays!